Osteopathy was founded in the late 1800s by physician and surgeon Andrew Taylor Still in Kirksville, Missouri. The son of a surgeon, Still soon discovered that in order to achieve the highest possible form of health, all parts of the body should work together harmoniously. His goal was to restore the body to optimum health with minimal surgery and medicine, influenced in part by the realisation that medical treatments of that time were largely ineffective and in some cases, harmful. Over time, during which he treated patients with a wide range of conditions, from dysentery to sciatica and arthritis, with varying results, he gained a reputation as an effective practitioner. Patients from all over America flocked to Kirksville for treatment. Soon demand was so high, boarding houses were built and train routes were altered to cater for the amount of people seeking treatment. 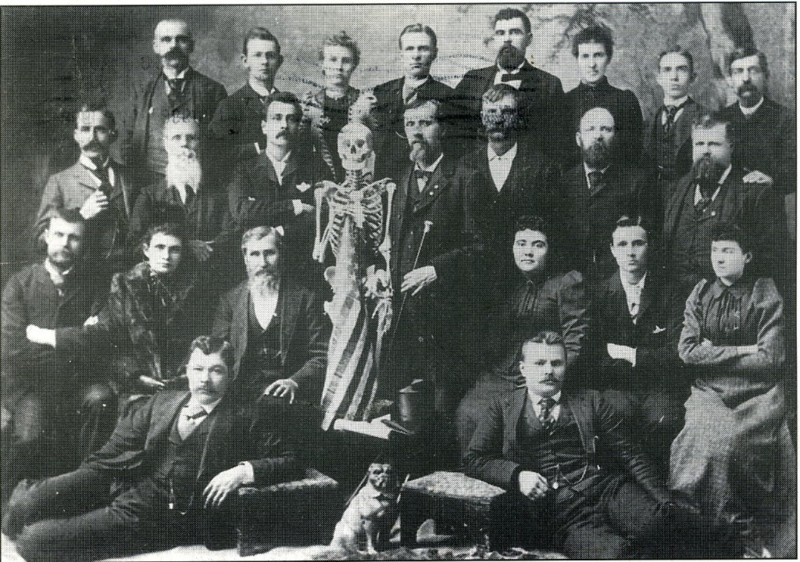 In 1892, Still took on the first wave of 22 osteopathic students at the American School of Osteopathy (now known as the Kirksville College of Osteopathic Medicine). The first class of both men and women (symbolic of Still’s strong sense of liberalism) were taught over a period of two years, and included in-depth education in physiology and anatomy. He drew in full practice rights for his students, and upon graduation, awarded them the title of D.O (Doctors of Osteopathy). One of Still’s early students was J Martin Littlejohn, who, after taking on a job as physiology lecturer at the American School of Osteopathy, registered as a student. He was made Dean of the school that same year. Following bitter disagreements with some of A.T. Still’s followers regarding the role of physiology within osteopathy, as well as other factors, he was released from his role as Dean, and moved to Chicago, where he established the Chicago College of Osteopathy in 1900. Theoretical education was expanded upon and physiology became a core subject. Despite criticisms from the American School of Osteopathy, the Chicago College of Osteopathy went from strength to strength and was seen as a key scientific osteopathic institution. Due to the onset of political changes, J Martin Littlejohn moved back to Britain with his family in 1913, where he worked in hospitals in a variety of jobs, until he helped found the British School of Osteopathy (BSO) and the Journal of Osteopathy in 1917. This helped to lay foundations for osteopathy in Europe. When the BSO opened, the British Osteopathic Association (formed in 1903 as a British branch of the American Osteopathic Association, where American-educated osteopaths came to live and practice) wanted a school based on American tradition where graduates practiced both osteopathy and what is known as ‘allopathic medicine’, meaning conventional medicine (Medicine Net.com, 2012). The BSO did not share the same views, and the BOA eventually made some leeway with this ambition with the establishment of the London College of Osteopathic Medicine (LCOM) (London Bridge Osteopaths, 2013) in 1946, which saw shorter osteopathic courses being offered to medical professionals, and therefore, the professionals graduating from the courses became the first British-trained osteopaths to start practice. In 1935, the BMA campaigned for a new parliamentary bill, which saw osteopathy being refused any official recognition. Osteopathy was considered to be outside of mainstream medical practice in Britain and was not a legally regulated profession until the introduction of the Osteopaths Act in 1993, which led to the establishment of the General Osteopathic Council, as well as the Register opening, in 1998. Like other medical professions, osteopathy is now subject to statutory regulations and qualified practitioners need to register with GOsC in order to practice and use the title of ‘osteopath’. The education and support for osteopathic students has continued to improve, with more and more colleges and universities accredited to teach osteopathy or support osteopathic colleges (both full courses, and shorter courses for medical professionals), such as Swansea University, Bedfordshire University (who currently validate the University College of Osteopathy, formally BSO programmes), and Anglia Ruskin University (who currently validate the London School of Osteopathy programmes).